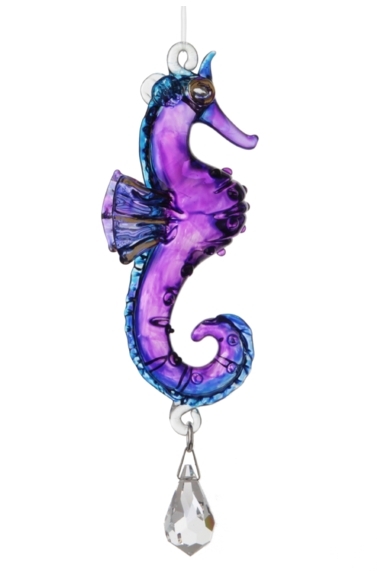 A hand blown, hand painted Fantasy Glass Seahorse. Painted in vibrant Purple colour, with a 24 carat gold hand painted bill and a Swarovski crystal drop. Each seahorse comes individually packaged in an illustrated and recycled cardboard box. Seahorses have no teeth and no stomach. Food passes through their digestive systems so quickly, they must eat almost constantly to stay alive, consuming 3.000 or more brine shimp per day. The male seahorse carries the female's eggs in his pouch on its abdomen until they hatch, then releases them fully formed, miniature seahorses into the water. As little as 5 or as many as 1,500 young can be born.